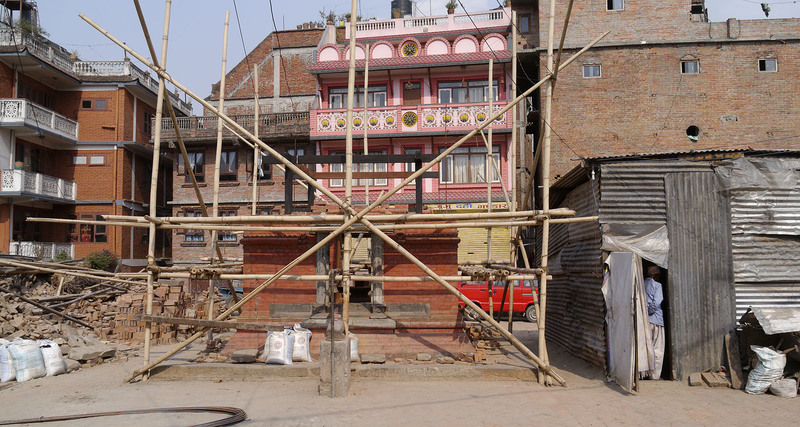 This issue's photo essay is about the ongoing reconstruction in Bhaktapur, Nepal, following last year's devastating earthquake. 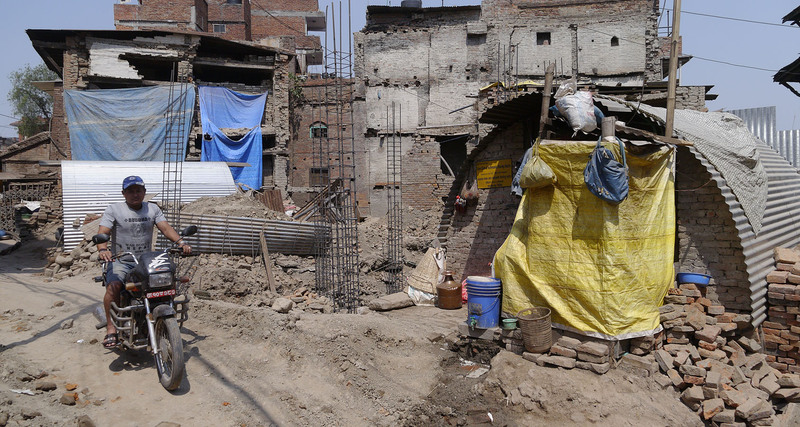 Most of the city must be rebuilt, which will take years. 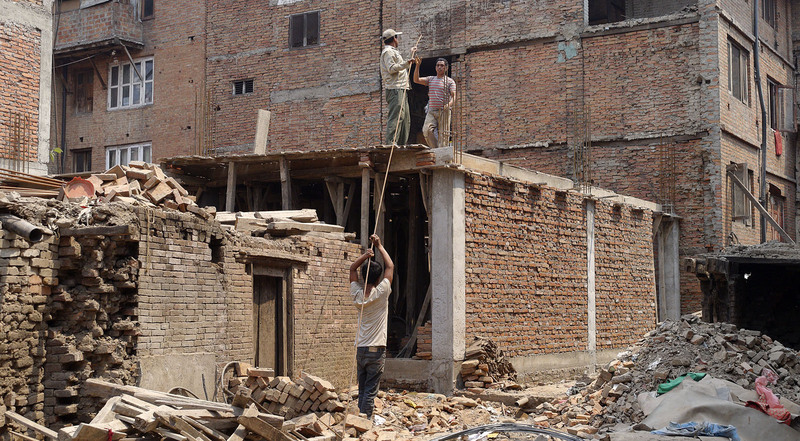 It has now been just over one year since the magnitude 7.8 earthquake struck central Nepal. 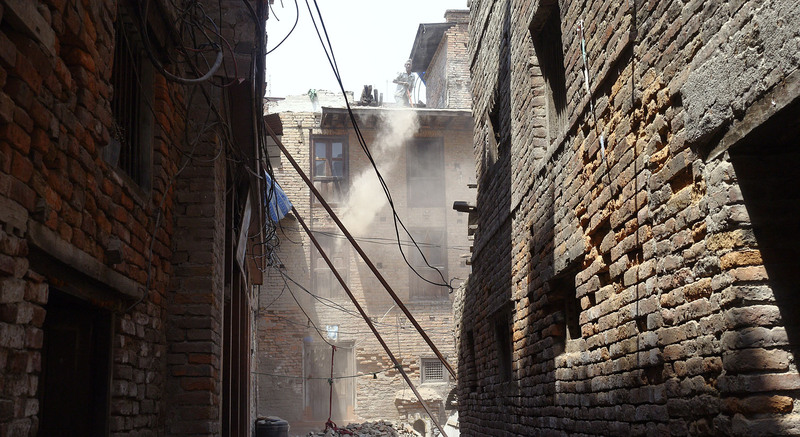 Bhaktapur turns out to have been one of the worst-hit areas. 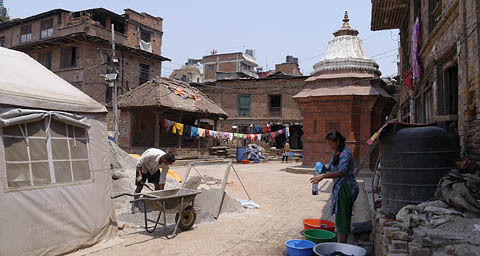 In the immediate aftermath of the earthquake, it was not yet apparent just how serious the damage was, and many buildings that seemed to have survived intact will in fact have to be demolished and reconstructed. 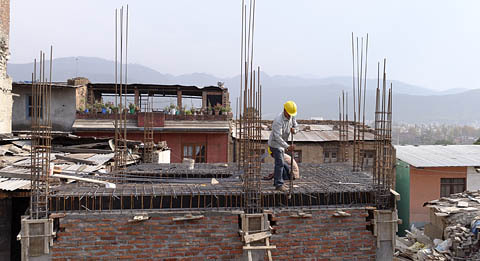 About 75% of the building stock requires replacement. 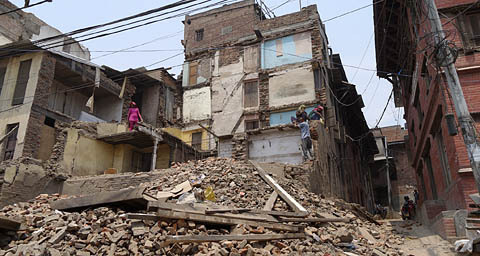 The earthquake was followed by a five-month blockade of Nepal's border with India. Everything was in short supply during this period including fuel and building materials. Despite a promise of over $4 billion in reconstruction aid from foreign donors, almost none of it has reached the affected citizens as of press time. 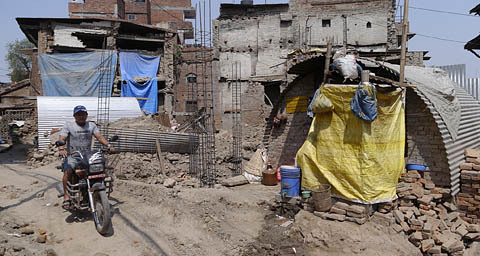 Despite this, locals are beginning the rebuilding process, even though the pace is still slow, with only a comparatively small number of buildings now under construction. In many cases, an existing building must first be demolished before foundation work on the new building can begin. 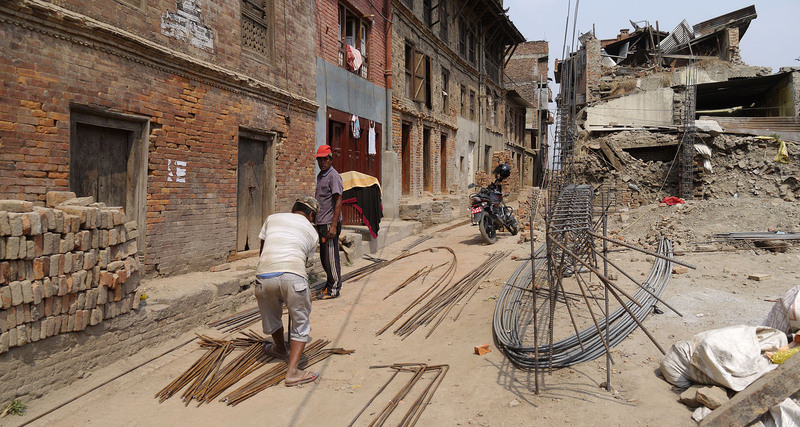 In the past few days, Ram Kumar KC, our resident photographer, walked through most of Bhaktapur and photographed the works in progress. 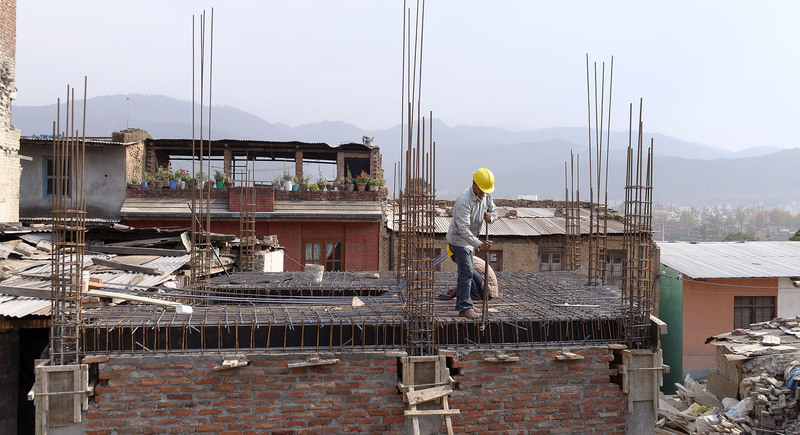 You will note that most new construction employs reinforced concrete for the pillars, beams, and floors. 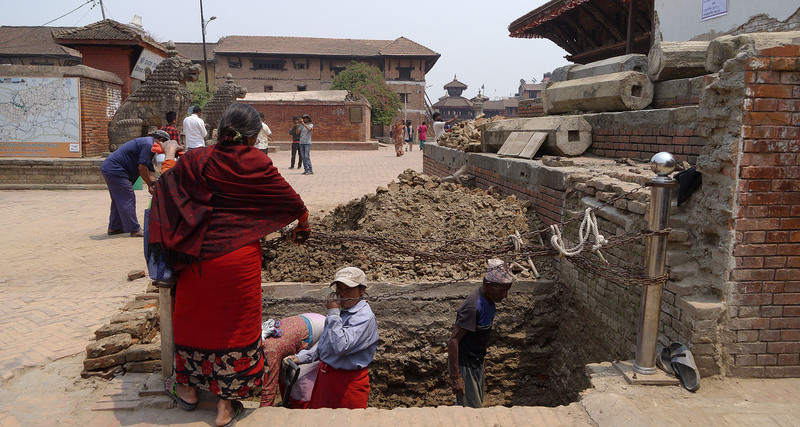 Buildings of this type generally survived the earthquake intact except for some cases where the foundations were inadequate or the structural elements were undersized. 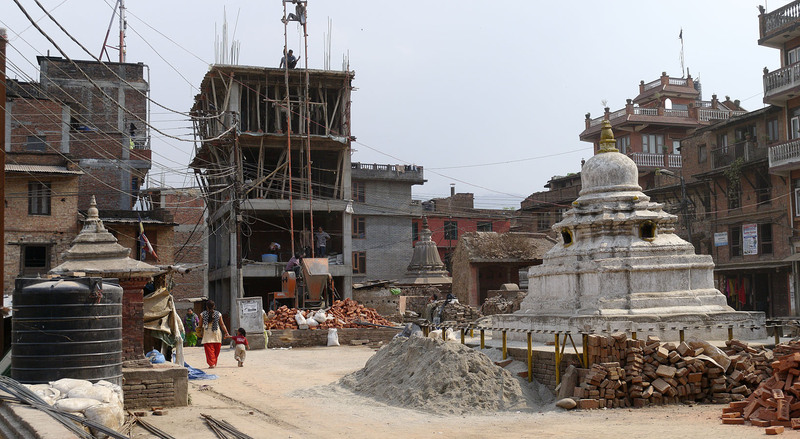 It is to be hoped that the new Bhaktapur will survive the next earthquake without serious damage. 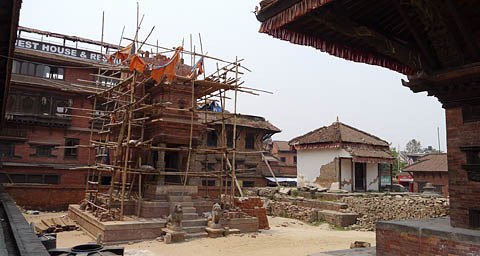 So far, most of the new construction seems to respect, at least to a degree, the architectural traditions of Bhaktapur in particular and Newari cities in general. 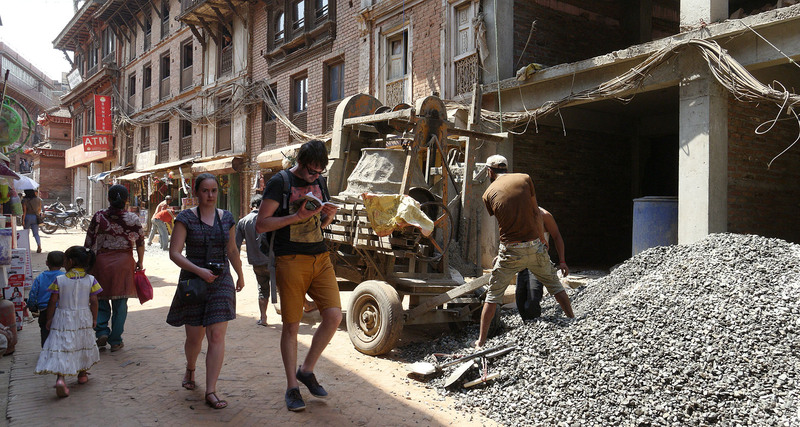 The urge to widen streets was fortunately resisted, so Bhaktapur will remain a walking city, notwithstanding the rapid increase in motorcycle ownership. Soon, there will be so many that there will not be space enough to ride or park in the city. At that point, something will have to be done to curb traffic. Not all of the demolition work was completed last year. 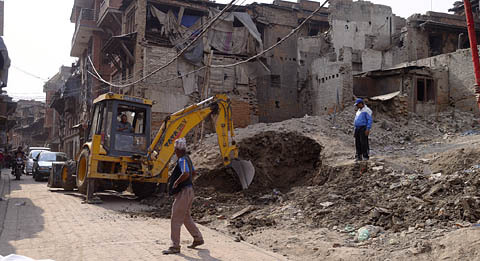 As always, demolition is dirty, noisy, and dangerous. Zinc-plated sheeting was used to construct many temporary shelters. 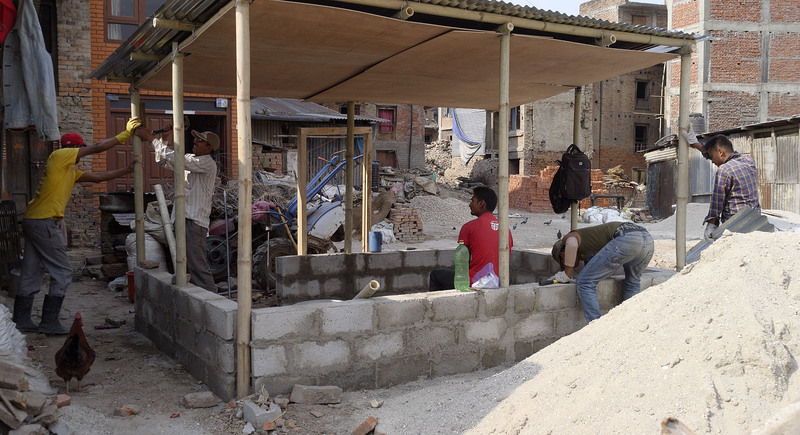 Some temporary shelters are still being built this spring. People are anticipating a long wait for permanent buildings. Heavy earthmoving equipment is rather rare in Nepal. 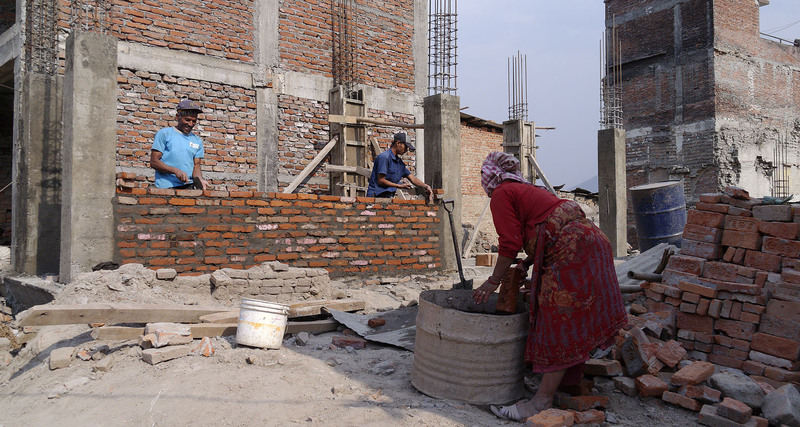 Most foundation work is still done by hand. This is where Durbar Square's White Gate once stood. In South Asia, nearly all reinforcing bar is bent in half for shipping. Straightening the bar makes a lot of extra work. 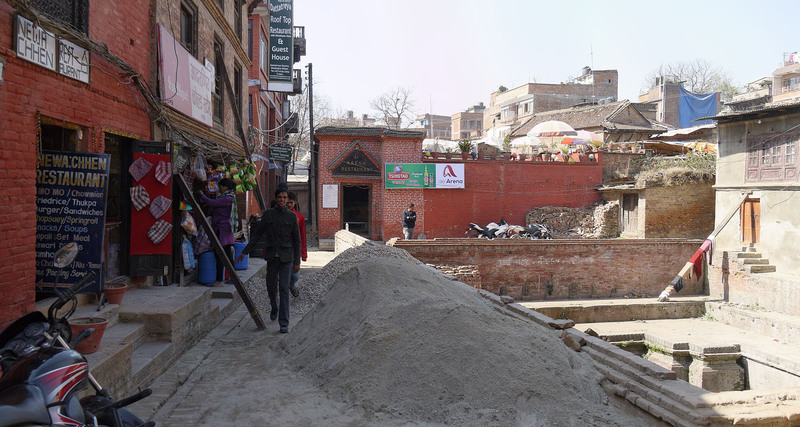 Piles of aggregate can now be found all over Bhaktapur. 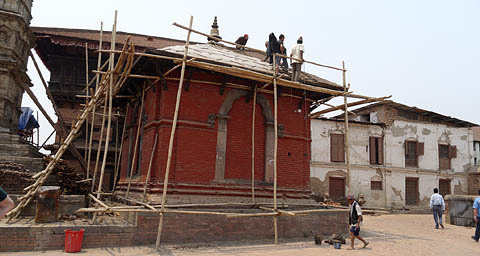 Quite a few bricks from old buildings will be reused. Screening of aggregate is done by hand. Small batches of mortar are mixed by hand. 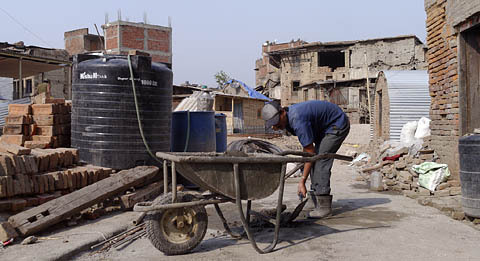 Medium-sized concrete mixers are used when pouring heavy work. 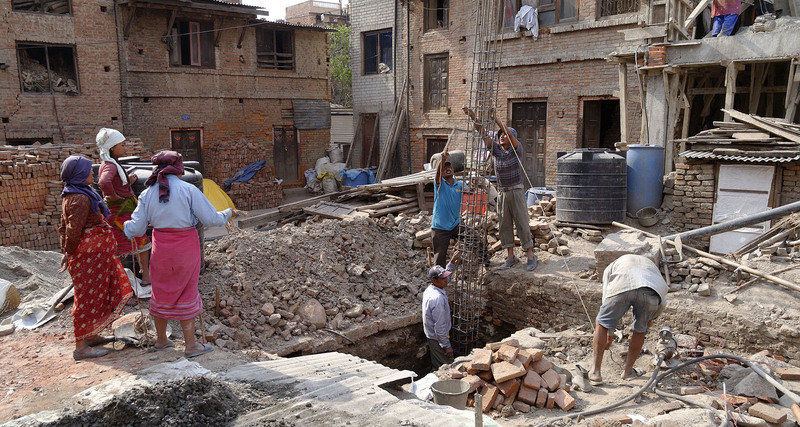 Inadequate foundations were a major cause of building collapses. It appears that the new work is being done more carefully. 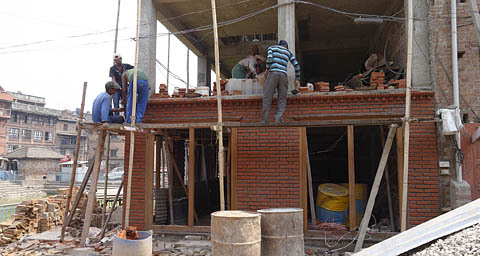 In the new buildings, the bricks are usually non-structural. This temple needed a new roof. 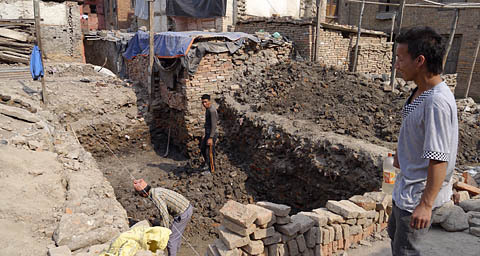 This temple, however, required reconstruction. probably because of German renovation work in the 1970s. A new, small temple rises from the ground. 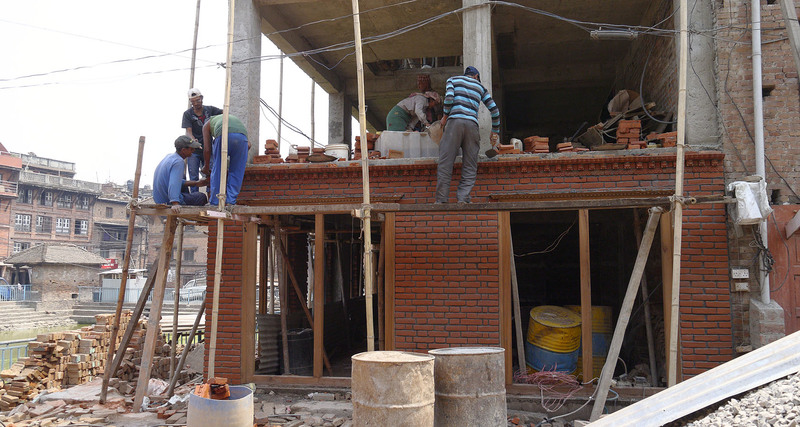 Work is slowed by the need to allow one story's concrete to cure before continuing. Many new buildings echo the traditional styles, often imperfectly. Before the earthquake, most buildings were about four stories tall. will probably reach four stories eventually. This 54-minute film was released last summer. It proposes solutions to the many challenges to achieving a sustainable society. The rate of views is climbing slowly and is approaching the 10,000 mark. The News Bits section below makes it clear that the long-dreaded climate emergency has now arrived. Temperatures are soaring, ice is melting, forests are burning, and there is no clear end in sight. CO2 in the atmosphere is actually increasing at a record rate despite some timid efforts to slow it down. The Paris COP21 talks last year set the goal of limiting warming to 1.5°C, which, it appears, we have almost reached (see Climate Change in News Bits), years before it had been generally predicted to arrive. I don't like the term "war on ....", but we do now need a global effort to halt climate change on an emergency basis. Nothing that is on the table now will achieve that goal; we must make much more serious commitments, and act upon them immediately. I can think of no better approach than that which we proposed in our film, Recovering from Disruption, mentioned just above. We will need major changes in just about every aspect of society as we know it. Fortunately, many of these changes can actually lead to a better life for everyone except maybe the richest 1%, who are largely responsible for the mess we are in. Perhaps the most shocking News Bit is the one showing that environmental causes are an important factor in 25% of all human deaths worldwide. But it gets even worse, because the environmental disaster is affecting virtually all life on the planet, which in turn affects the capacity of the Earth to continue to provide a home for us all. It's too early to know for sure, but all the signs point to our having arrived at the climate tipping point. The huge increase in atmospheric methane is extremely scary. It may be the harbinger of runaway warming, as methane is a very potent greenhouse gas, and it is expected to be released more quickly as the climate warms. The time to leave fossil fuels in the ground is right now. A large carbon tax, preferably enacted unilaterally by each nation as fast as it can, is almost essential. I can think of no other measure that will achieve the necessary reduction in emissions of CO2 and methane. The building of fossil fuel infrastructure continues despite the fact that energy from renewable sources is becoming cheaper than from fossil sources even before the costs of greenhouse gas emissions are added. Still, market mechanisms will not achieve change fast enough to solve this crisis. I used to think that the climate crisis was an academic matter for me personally - I would be long dead and gone before the worst hit. Sitting here in Bhaktapur, I am no longer so sure. Every night I see the red glow of forest fires on the mountains to our south. The air is dirtier than it was just two years ago, when I moved here. The extended drought in South Asia has caused the fires, and it has also caused a severe water shortage. The rate at which Arctic sea ice is vanishing is almost unbelievable. So, these days, I wonder if the climate is going to kill me after all. If it doesn't get me, it will certainly get people I care about who are younger than me. It's time to prepare yourself for major changes, sooner or later. The major changes we make sooner will be, I promise you, far more palatable than the major changes that nature will soon force upon us. The news is all full of electric cars and robotic cars, and cars, cars, cars. Only the Guardian has dared to question how this all plays out. So, supposing that we build the necessary fleet of robotic cars and find enough energy to recharge them, what problems have we actually solved by this measure? Yes, perhaps the energy and pollution problems have been fixed, and maybe the safety issues with cars as well. What unsolved problems does this leave? Well, it's a long laundry list. Cars will always take up too much of the precious land in cities. They will always make too much noise at high speed. They will always be an ugly blot on what should be the beautiful faces of our cities. They are inherently isolating and lead to weaker social bonds. Even if they are perfectly clean and are never involved in collisions, they are still a public health menace, as they discourage people from walking and cycling and so lead to increased death rates from a long list of causes. Their presence in large numbers will continue to depress real estate values near highways. They will continue to consume immense amounts of money for their construction, operation, and scrapping. 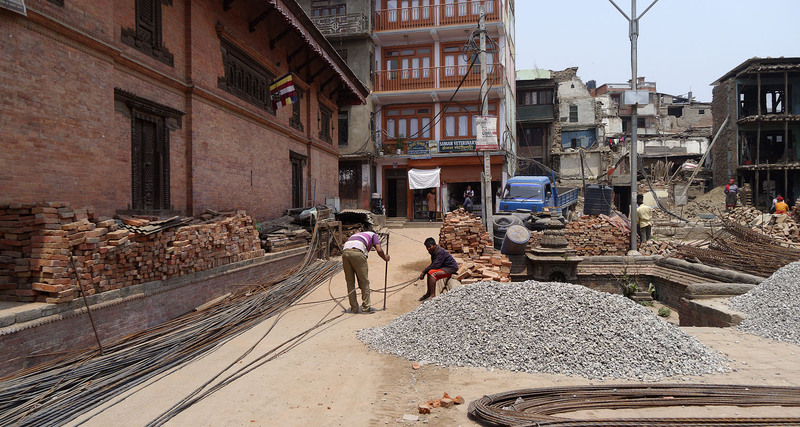 The public will continue to subsidize the construction and maintenance of highways. These highways will continue to form barriers that divide communities. As I said 16 years ago in Carfree Cities, the car "will remain the most expensive, most resource intensive, and least sustainable method of urban transport." The passage of time and the advancement of technology has only served to strengthen my conviction that cars just don't belong in cities. "Jane Jacobs Was Put to the Test in 6 Italian Cities"
"Bike, pedestrian-friendly cities are worth the fight says former NYC transport planner"
"Washington State Kids Score Huge Legal Win In Climate Change Lawsuit"
"Judge Denies Motions by Fossil Fuel Industry and Federal Government in Landmark Climate Change Case"
Global land and ocean temperature anomalies, January-December. "Record leap in carbon dioxide seen in 2015"
"Humans and El Niño Team Up to Create a Record Jump in CO2 Pollution"
"Why is 2016 smashing heat records?" "NOAA: Monthly Temperature Reports Are 'Sounding Like A Broken Record'"
"Scientists beat the alarm: Levels of methane increasing rapidly in the Arctic"
"Global warming may be far worse than thought, cloud analysis suggests"
"Antarctic ice melt could drive sea levels up twice as high as we thought"
"Fossil fuels could be phased out worldwide in a decade, says new study"
"In a World Made Toxic, Nearly a Quarter of All Human Deaths Caused by Pollution"
"We don't need self-driving cars - we need to ditch our vehicles entirely"
"Nearly all US forests threatened by drought, climate change"
"Cuba's sustainable agriculture at risk in U.S. thaw"
"Plants boost extreme temperatures by 5°C"
"Eemshavencentrale Nuon wordt 'superbatterij' voor zon- en windenergie"
"Volvo sells electric bus system to Namur in Belgium"
The next issue of Carfree Times is scheduled for August/September 2016.